The archaeology being considered is that bounded by the outer curtilage of the Hyde Abbey at the time of the Dissolution in 1539. 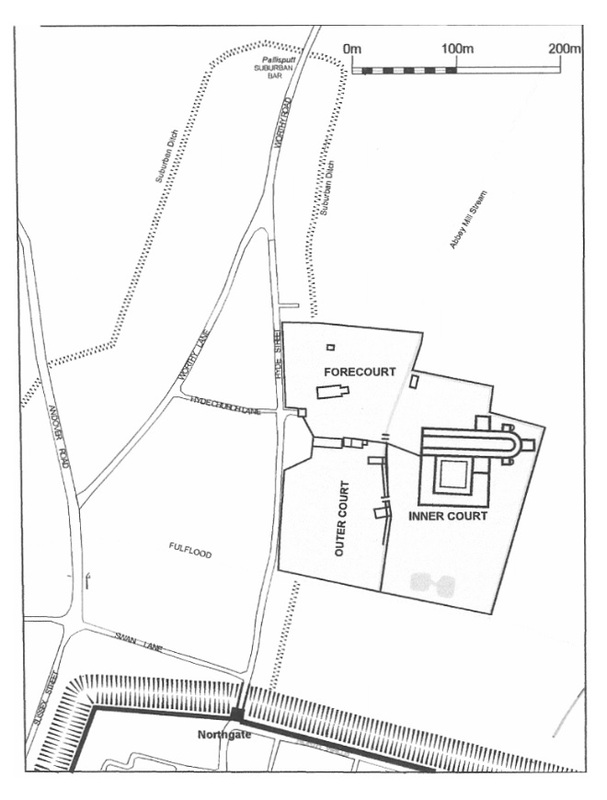 The abbey prior to 1285 was confined to the area of the inner and outer courts (Fig 4.1b Post 1285 HA precinct). After acquisition of additional land around St Bartolomews church it was extended to include the outer court. 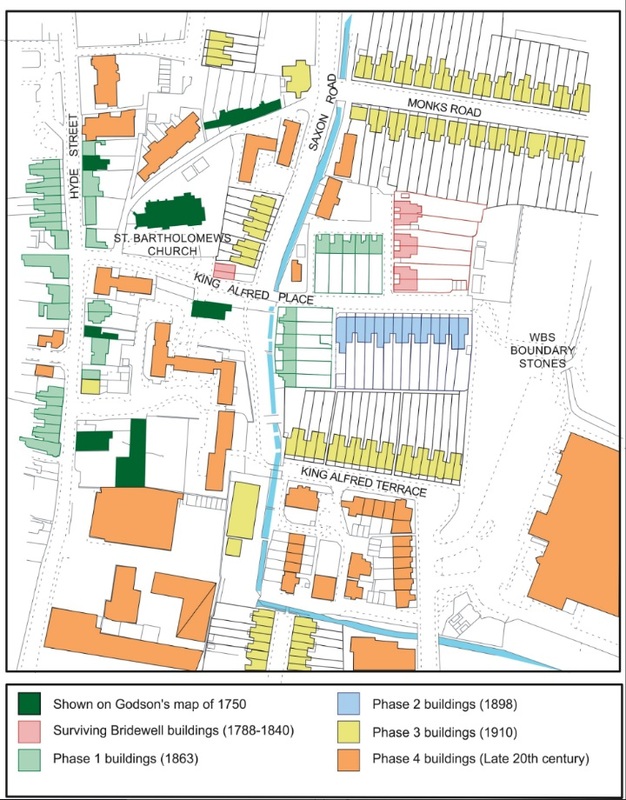 The archaeology that remains today (2017) has been severely affected by the fact that the area is now largely covered by high density housing built in the period 1863 to date. 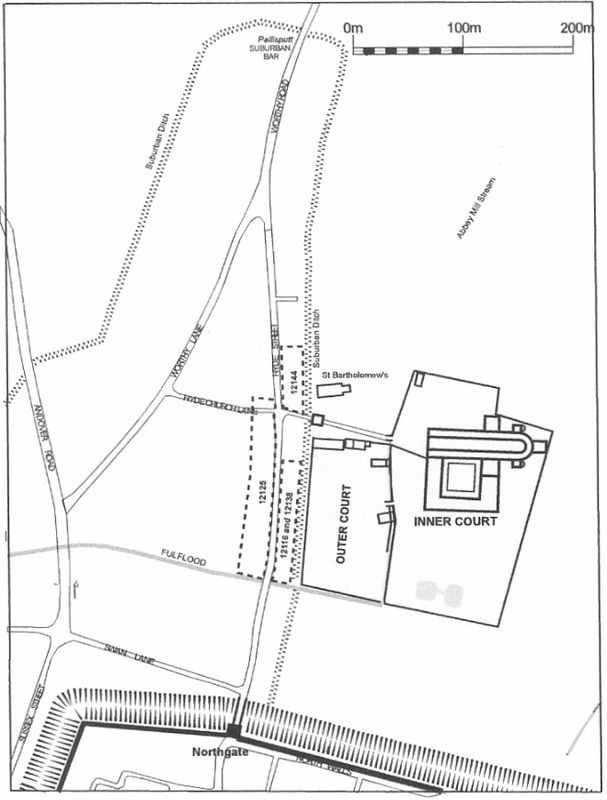 (Fig 4.1c Modern development of Hyde Abbey site). In March 1980 a gas trench, cut along the roadway of King Alfred Place, was observed by Archaeology Office staff. At a point opposite the western side of 9 Alswitha Terrace, the bottom course of a wall was observed in the north section of the trench at a depth of about 0.5m below the road surface; this extended 2.3m to the west. The wall, of chalk lumps in pale buff mortar, rested on a rammed chalk foundation which extended for about 19m to the west. This wall may possibly have been part of Hyde Abbey Church, or the 18th century Bridewell built on its site.